Isopod Friday, "Free CHUCK Toy!" 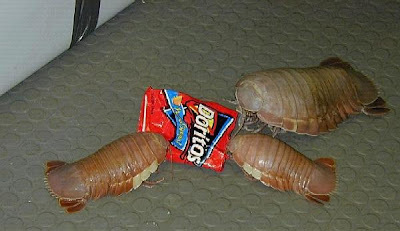 I hope you've all enjoyed Isopod Week. I know I have, this was too much fun. 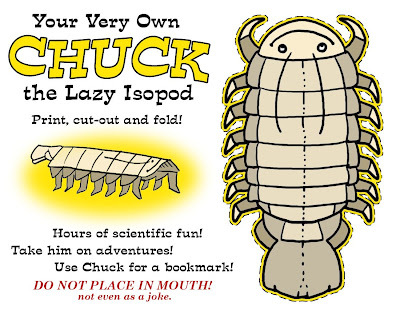 Please accept this parting gift, a free "CHUCK the Lazy Isopod" paper toy. 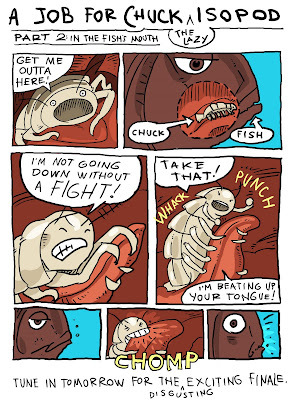 Isopod Thursday, "Chuck, Part 3--the Finale"
This little story is true. 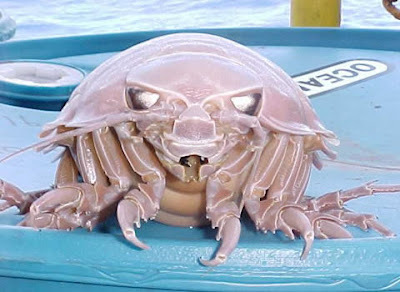 This particular isopod, Cymothoa exigua, or "Tongue Louse" eats away a fish's tongue and then becomes the tongue. Pretty gross, eh? It's the only case of a parasite that becomes a working part of the host's functioning anatomy. If you want to learn more (and why wouldn't you?) this Animal Planet article has more info, and some really disgusting photos of the tongue louse in action. Click it if you dare. One more day in Isopod Week. What will it bring? How could we possibly top the epic of Chuck? 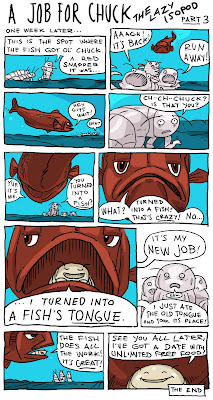 Isopod Wednesday, "Chuck, Part 2"
Here's Part 2 of the thrilling saga of A JOB FOR CHUCK, THE LAZY ISOPOD. If you are new to the cartoons, scroll down and start at Part 1 or you will be totally lost. 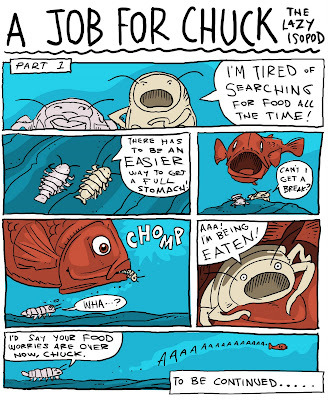 Isopod Tuesday "Chuck, Part 1"
I've dropped the line-width to make for easier reading, the earlier ones have been a little hard to read. You can click on the comic to enlarge, but then it's too big. Hmm, still trying to find the right size for this kind of thing. Any pointers? 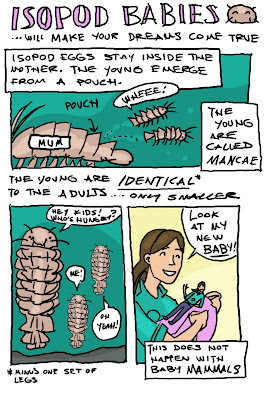 I had so much fun doing yesterday's isopod comic, I thought I'd try again. 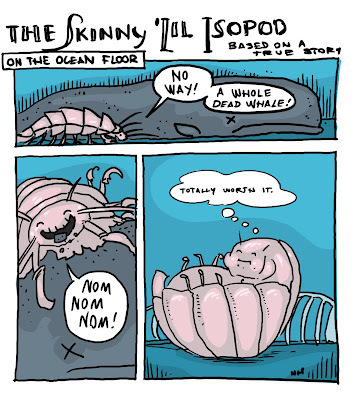 Isopod Saturday, featuring "THE SKINNY 'LIL ISOPOD"
FACT: When a Giant Isopod finds a large source of food, it will gorge itself to the point of immobility. FACT: This is my first ever web-comic. How'd I do? I don't actually have a week's worth of Isopod paintings. 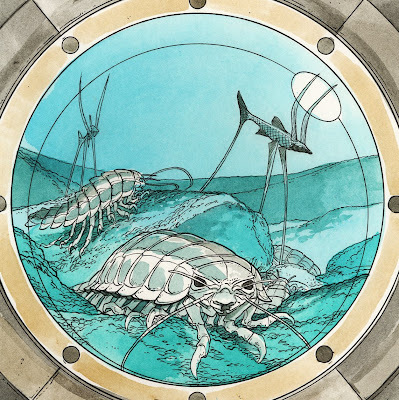 In fact, as of this moment, I only have one, half-finished isopod painting. Here it is, in progress, it still has a ways to go, but it's Isopod Friday, I gotta show something! According to Wikipedia: In Northern Taiwan and other areas, they are not uncommon at seaside restaurants, served boiled and bisected with a clean lateral slice. The white meat is similar to crab or lobster in texture. Hey gang, remember Jester Week, and how much fun we had? Well, Jester Week is over and never coming back. We're now starting ISOPOD WEEK! Provo Children's Book Festival FIRE!!! Here's a random scene from Saturday's Provo Children's Book Festival. That's me, Dean and Shannon signing Rapunzels. 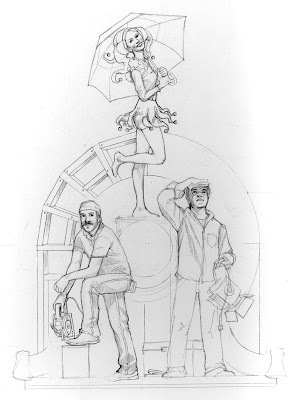 If you look really closely at the bottom of the photo, you might get a glimpse of the new CALAMITY JACK cover. There was a giant turn out (this picture looks pretty bare, but there were hundreds of people there, as well as at least twenty authors. In the background you can see a big screen, this was a cool overhead camera that showed what the illustrator was drawing--I did that for a few hours, drawing dinosaurs and dragons for kids. Oh, also, about two hours into the festival, a little kid pulled the fire alarm and the building was evacuated. A sci-fi/fantasy author panel was going on at the time, and those guys just kept on talking through the alarm. Didn't even go outside. Thanks to Lauren for taking the photo. Last year I drew portraits of attendees--I think I drew about 80 kids' portraits. It was fun! This year promises to be even better, I don't know if I'll be doing portraits again, you'll just have to come and see. Bring your Rapunzel's Revenge, the ENTIRE Team Rapunzel will be there. Me, Dean and Shannon. You could own an ultra-rare triple signed copy! 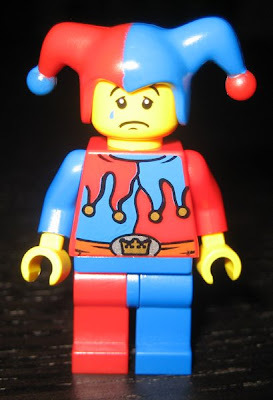 Woops, I totally forgot the main image for the ground-breaking jester. The other two from yesterday were just supplemental. 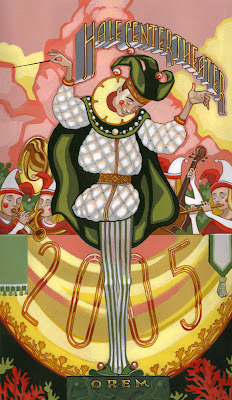 This is the image that was on the print, as well as on the '09 jesters' trunk. And that's the real end of Jester Week. I hope you've all enjoyed Jester Week. I have a few extra items, so I thought I'd extend the week one more day. The jester herself is in the same pose, but we also have Bobby, the set designer, and Cody, the lighting director doing their thing, with the jester standing up on a half constructed set. The main issue with this one was that the figures all ended up being tiny. The close up of the Jester works better. Less is more, right? Last of all, here are a few promotional images I did for the theater last year. These were to celebrate the groundbreaking of a new theater building at a place called Midtown Village. The central tower there is the landmark the jester is climbing on. If you look closely at the trunk of the '09 jesters, you can see a tiny version of this. 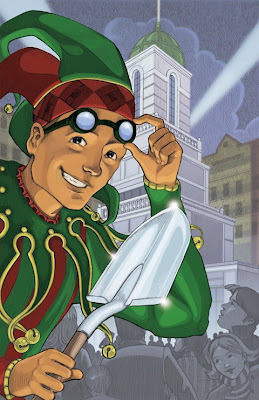 The jester is holding a shovel for the groundbreaking ceremony. Everyone who came to the groundbreaking got a big print of this. The theater actually had a guy dressed in this very jester outfit running around with a shovel. These images are different from all the other jester images in one major way. Illustrators, can you guess it? Digital coloring. That's right, all the other jesters were acrylic paintings, but the groundbreaking jester illustrations were hand drawn in pencil, then colored with Photoshop. Similar to the way the Jack and Rapunzel books were done. The sad part of this story is that the ground was broken for the new building, then, of course, the entire world economy collapsed. 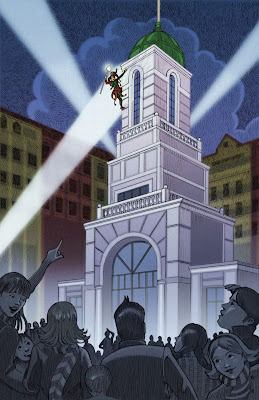 So the theater is still rocking the old white building (the one in the '07 Jester's hands.) Hopefully, when the economic climate heats up a little, they'll get that new building. We've got big plans for a HUGE jester mural in the lobby, so keep those fingers crossed. This ends Jester Week. Regular programming will now resume. Waaagh! Kids, this is what happens when you put a CMYK, print-ready file on the internet. Yikes! She looks like a blueberry! And why am I getting underscoring on the type? Boy, Jester Week is really ending on a high note here. Ahh. That's better. This is the new jester, I'm very happy with how she turned out. The girls from '09 worked out so well, that I used a model again. This is triathalon winner Erin Collins, a friend of the set designer at the theater. The original plan was to have a bunch of set construction guys building a set, with the jester out in front doing nothing. I shot photo reference of three guys doing work, but in the end just focused on the jester. Keep it simple. 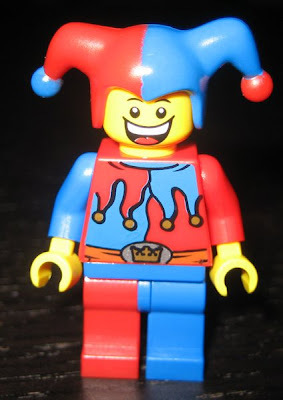 I hope you've enjoyed jester week--I may squeeze in one more day of it tomorrow with some extra jester stuff. The '09 jesters catch us up to this season! The '08 cover was so odd, that I decided to go classic in 2009. 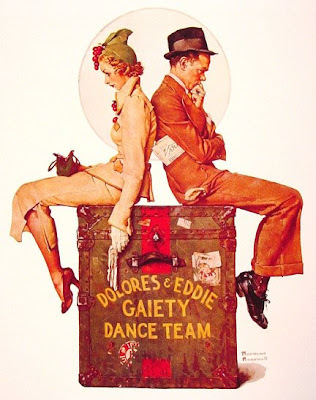 And what's more classic than an old fashioned, Norman Rockwell homage? These kids are twin daughters of two of the theater owners. This is the only jester painting I've used photo reference on. We did a photo shoot at the theater, they were wearing jeans and hoodies. I faked the outfits and the masks. I even did my signature in the Norman Rockwell font. This is as close as I've ever come to straight up copying an illustration. I've gotta say, it was really fun. Ouch, seeing them side by side like this makes me realize that ol' Normy's roughly 400 times better at painting than I am. The 2008 jester is the weirdest of the bunch. A total departure from the earlier ones. The hat is supposed to be reminiscent of an egyptian head dress. 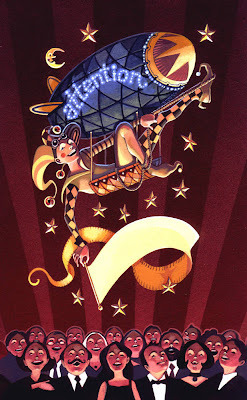 One of the big shows that year was the musical AIEDA, so I tried to put a little egyptian twist on the jester. Yeah, didn't quite work. But there is something about this image that keeps you staring at it. 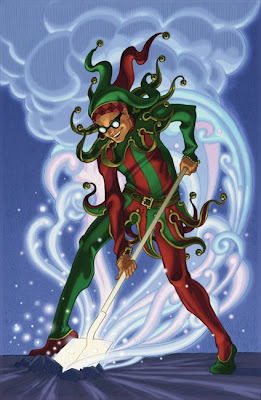 2007's jester is a little mysterious. He's a more subdued and sober jester than the earlier ones. He's dressed in mourning black. The HCT family suffered two deaths in 2006, director Syd Riggs and owner Sally Hale. 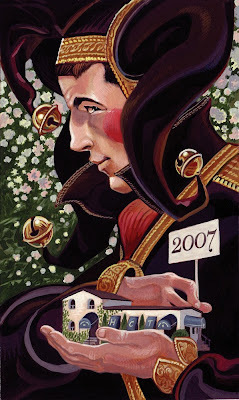 So the jester wore black in '07, but he's carrying the little theater around as if to say, "The show must go on." 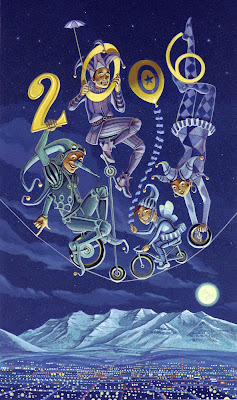 Here are the 2006 jesters doing a tightrope routine over Utah Valley. The mountain range in the background is Mount Timpanogos as it appears from Orem. The theater is visible somewhere on the grid below. Can you find it? I can not. [Update] I meant to mention that the city lights and moonlight were inspired my Mark Buehner's paintings in the book A Job For Wittilda. I forgot to post that--then tonight I ran into Carol Buehner, the author of the book, at an author get-together. Woops! Consider it now mentioned! And check out Wittilda! Okay, how weird is this? 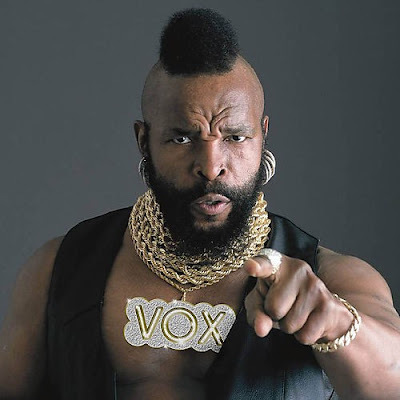 We're in the middle of Jester Week, and who should bring up jesters, but Mr. T! There you have it. Mr. T was visited by the ghost of a jester. Here's 2005. The jester orchestra. 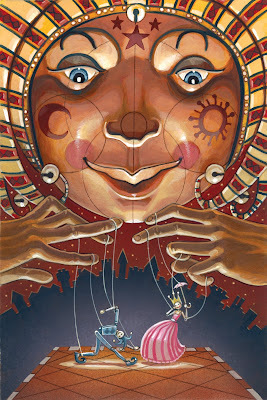 I've talked before about how I got my start in illustration doing theater scenery. I don't get much time to do it anymore, which is too bad, because it was always a lot of fun. Especially the outdoor, summer theater stuff. 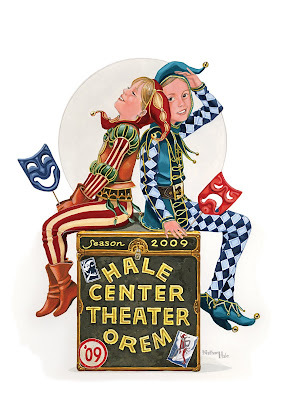 The only chance I get to be involved with theater anymore is the painting I do for the Hale Center Theater's seasonal brochure. 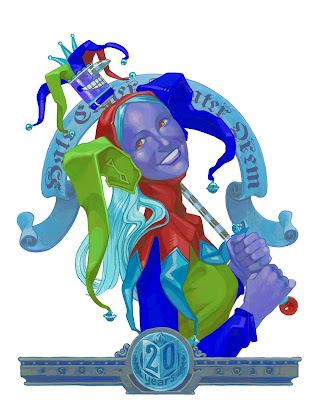 The theme is the same every year, basically: Jesters.